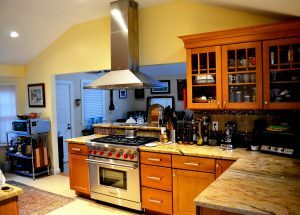 Wife and husband team, Marlene and Jeff, are passionate cooks and dinner hosts extraordinaire. 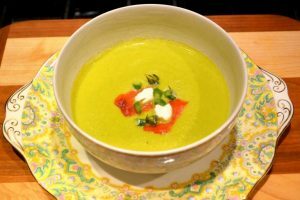 They will show you how to prepare a sophisticated and fun dinner for a small group (you) and let you in on practical tips, shortcuts and plating techniques to elevate everyday meals into extraordinary ones. Artist and wine consultant, Jeff might even share a secret or two on setting up the right ambience or how to pair your wine with food. You can participate as little or as much as you want—think of it as a cooking class where you get to party, or a party where you’ll learn how to cook! Like alchemy, cooking transforms the mundane into something magical and complex. Learning to cook well, we not only are able to sustain ourselves, but we make something from our own actions from which we can take pride. In a Refined Cook class, we create four to six dishes from scratch for a three or four course dinner party. 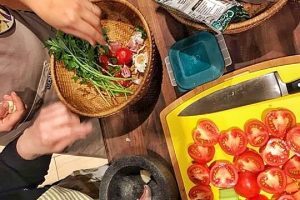 You will learn about ingredients, cooking techniques and time-saving short cuts so that you’re inspired to re-create this experience at home or experiment and create new ones. The Japanese believe that food should be enjoyed with as many senses as possible. In a Refined Cook class, not only do we focus on taste, but on presentation and artful plating, so that we feast with the eyes as well. We will be cooking beautiful food and sampling our creations in an elegant setting surrounded by art, music and the tantalizing aromas of our creations. Your Refined Cook hosts are artists (see About Us) who believe that beauty feeds the soul and that being well-fed in both spirit and body makes us all a bit happier. Learning and joy come about when we are free to play and make mistakes. We encourage experimentation in a Refined Cook class and we certainly play with our food! Just because our surroundings are beautiful doesn’t mean we can’t horse around, because we will. 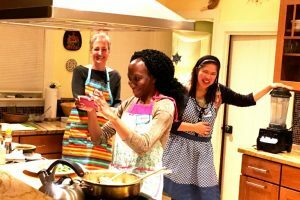 After all, a Refined Cook class is a party too, where folks from different backgrounds, sometimes from distant lands, and always with a story to tell, come together because we all love great food. 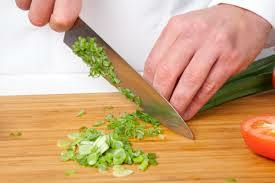 When we say we want to bring the joy of cooking to the home, we mean it, because a Refined Cook class is fun! Designed for young adults 18-28 years old who are new to the kitchen, these hands-on classes will cover basic cookery such as safety and hygiene, gadgets and equipment, knife skills and practical techniques that will get you cooking real food in no time! Learn More.